Here at Incontinence Choice, our range of bathroom towels come in a wide variety of sizes and colours, suitable for home bathrooms, guest rooms, hotels and care homes. 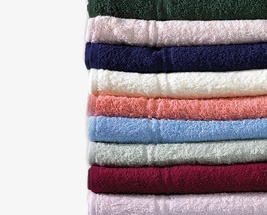 These towels are fast drying, so when needed can be washed and dried quickly and re-used, with the high quality material being snag free and long-lasting. Please browse our range to find the right towels for you.